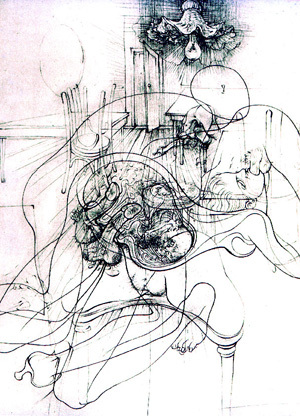 A simple example of this is offered by the Surrealist artist, Hans Bellmer. In his work, the transparency of the figures allows us to obtain angles, see forms, and note anatomy that, otherwise, would be beyond the reach of our normal vision. In our mind, we are able to enter more deeply into the figures and explore their physical relationship. Nothing is occulted from our vision.